Comparison of Tablet vs phone for large print. | 22 Point Blog! Comparison of Tablet vs phone for large print. Unfortunately it doesn’t quite work that way (see above image for how the Play Store actually looks). Some apps actually do simply scale up and look very similar, only larger, on the bigger screen. 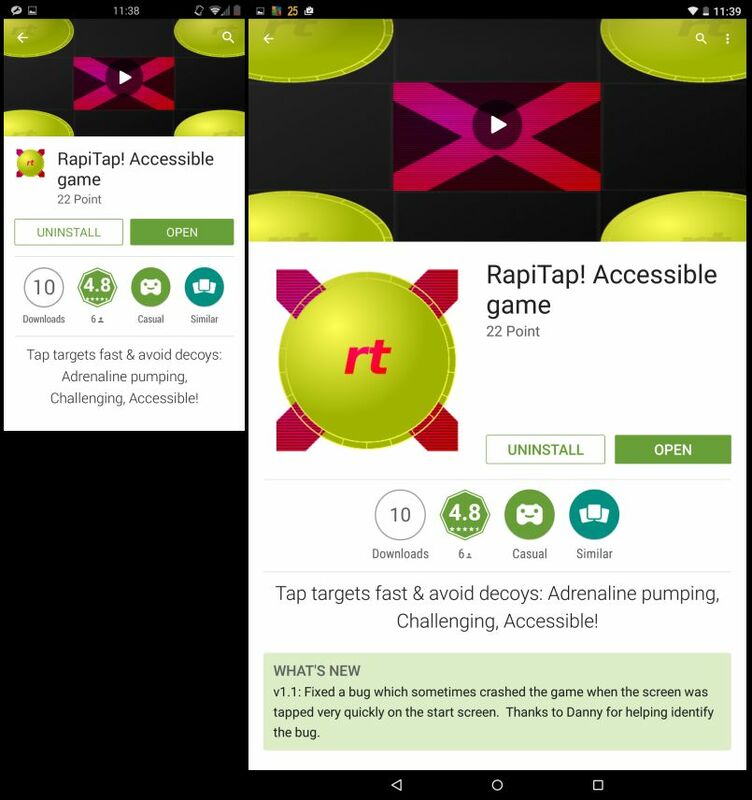 A lot of games particularly, such as Talking Stones, TriXOR and of course our own RapiTap! 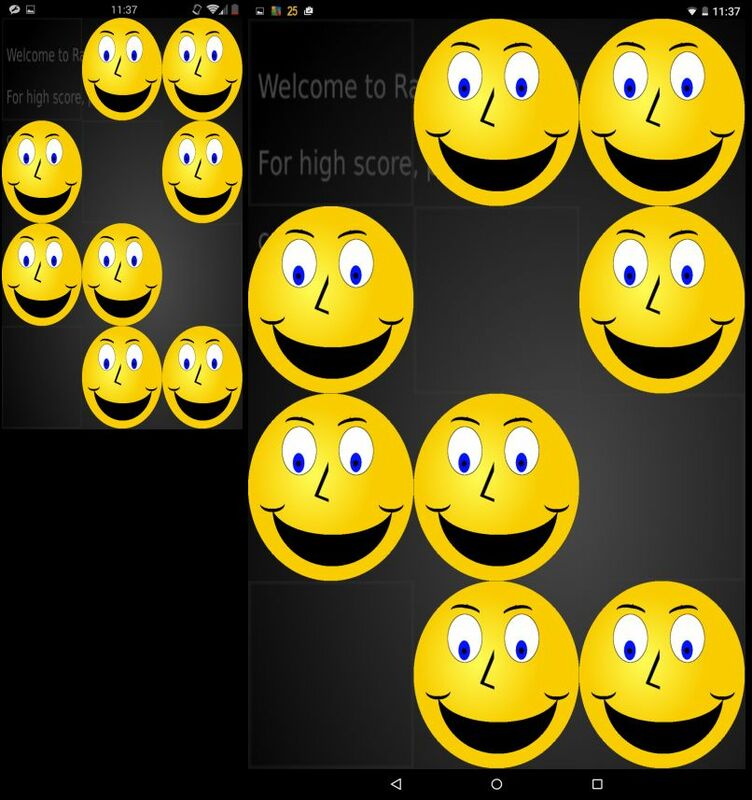 have game areas which fill the screen and so end up much easier to see on the tablet than on the phone. While some graphics, depending on how the developer has designed it, will scale up to the bigger screen (eg the playing area in the games I mentioned), text doesn’t scale in the same way. 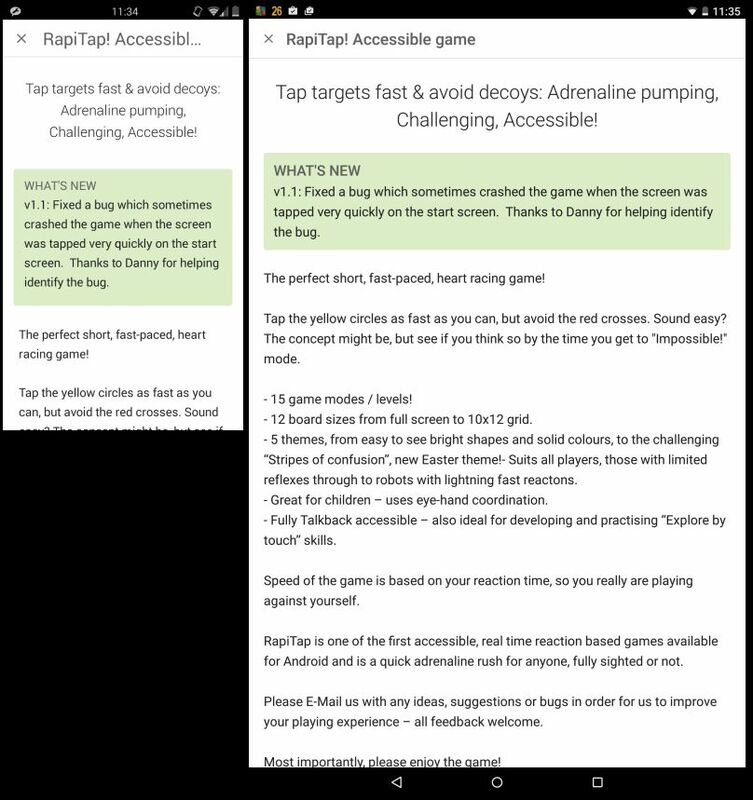 On my phone at “Normal” text size, Titles in the Play Store are about 16pt with description text 10pt. On my tablet, text is only slightly larger at about 20pt and 12pt respectively. On a bigger screen then, you can fit a lot more text while making it very slightly larger. Many apps, particularly those mostly displaying text, try to take advantage of the extra screen real estate by fitting more content in rather than making the existing content larger, and indeed Google’s own guidelines encourage setting things out differently on tablets, particularly larger tablets. This is similar to the push for web sites to adjust themselves to display on the smaller screens of phones and tablets. In the case of websites, this is a good thing for low vision users, as a desktop version of a web site is generally more cluttered – often with three columns of text, which is (arguably) navigable on a 27” desktop monitor but requires a lot of panning (at best) on a mobile phone, even for fully sighted users. The parallel can be drawn between a multi-column broadsheet newspaper, which is quite large physically, while a paperback novel, which is much smaller, would almost never be printed with more than one column per page. So coming back to apps, because each app, just like each website, is unique and setup to the developers ideal of how it should look, there are guidelines of how apps should consider best using the varying amounts of screen space on different devices, however it’s up to each developer to apply that to their own apps. Another consideration is “orientation”. 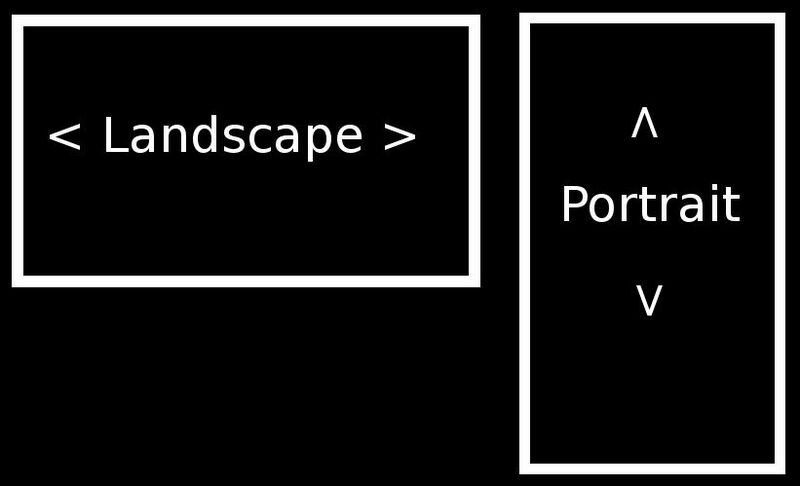 Since most devices have screens which are rectangular, there are two main positions they may be held in: “Portrait” has the longer edges to the sides and shorter edges top and bottom – as in a painting of someone and “Landscape” has the long edges top and bottom and short edges to either sides, as in a painting of fields or a beach scene. Commonly, people tend to use mobile phones in portrait orientation, where it can be easier to reach much of the screen holding the phone in one hand while tablets are often used in landscape orientation, similar to laptop screens. 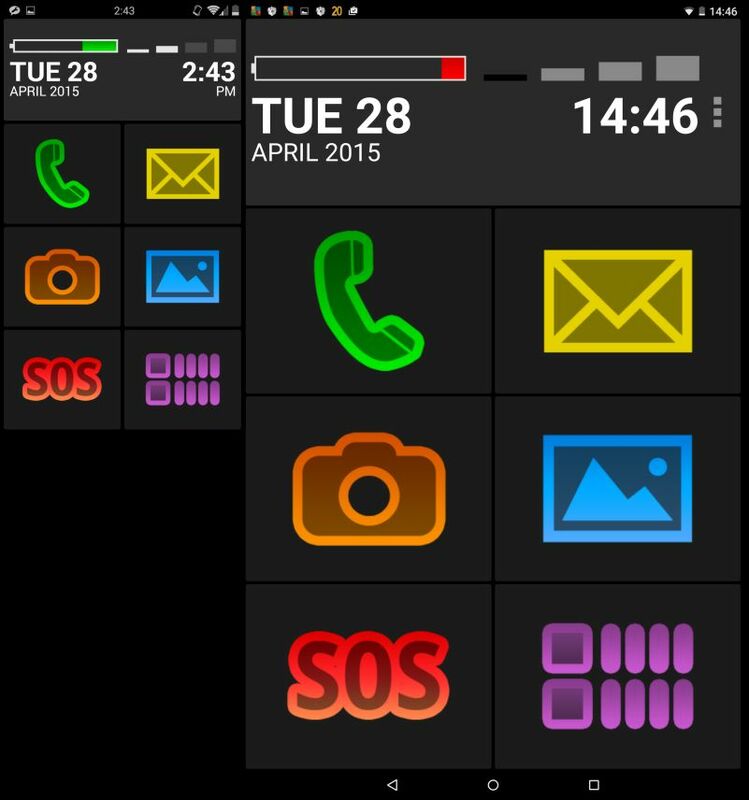 Potentially an app might have four different layouts to cater for each combination of orientation and device size. In actual fact, apps may have even more depending on less obvious factors such as screen resolution. In practice, often there will only be a couple of main screen layouts with some elements designed to enlarge to fit the space available and others designed to automatically move down to make room as needed. 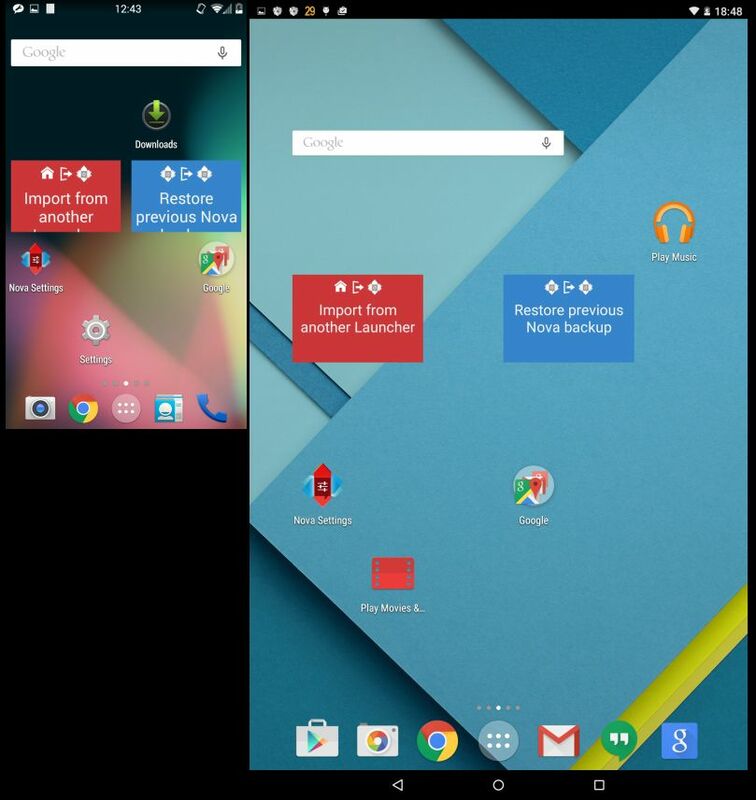 I’ve picked Nova as it’s very similar to the stock launchers available on most devices and it’s accessible. On the phone, in portrait mode, the default setup is 4 icons wide by 5 high. There is an unmoving “dock” of five slightly smaller icons wide at the bottom. By default, the orientation is locked to portrait, but if I set it to auto-rotate and turn the phone to landscape, the 4×5 main part of the desktop rotates with the screen so the items are in more or less the same position, though as the main part of the desktop is now wider than it is high, the space above and below the icons has been pretty much removed, but there is more blank space on each side. The dock has now moved to a vertical position running up the right hand edge of the screen and you still swipe left and right to change screens. On my tablet, Nova switches between protrait and landscape by default. In portrait, it looks similar to on the phone, however the grid is larger, at 6 icons wide by 6 high, with a dock of 7 icons at the bottom. Icons now are about 13mm high compared to 10mm on the phone. There is a gap nearly big enough for an icon above the top row of icons and again between the bottom row of icons and the dock. With the tablet in landscape, the layout stays at 6×6 and the dock this time stays at the bottom. Again the gap between each row of icons diminishes and this time there is a gap of nearly an icon width at the left and right edges of the screen. Overall the four modes are largely similar, particularly if you leave the phone set to Nova’s default of being locked in portrait. 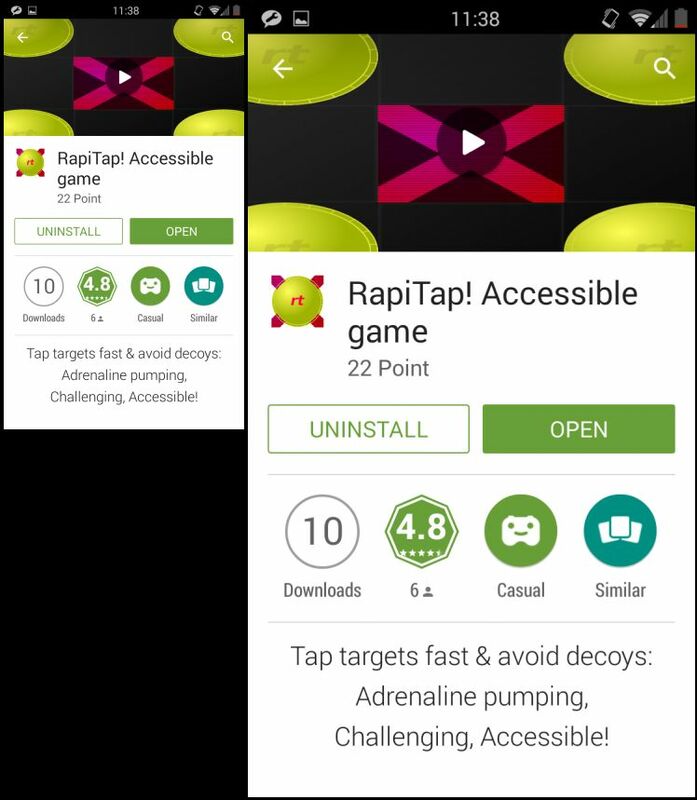 A sighted user shouldn’t have much difficulty in jumping between them although the larger screen arguably doesn’t provide a low vision user with much benefit here, as although the icons are larger, they are not considerably larger. Nova does have the option to resize icons up to 130% of their original size (or shrink down to 70%). You can also adjust the number of columns, though this only changes the amount of space in between icons, it does not adjust sizes. Both of these options are available on phone or tablet. On my phone, in portrait mode, the screen has two columns of 4 icons, with the top icon in each row being replaced by a pane showing the battery level and date on the left with signal strength and time on the right. The date and time are in 24pt font, with the month and AM or PM being half that at 12pt. In landscape mode, each icon rotates 90 degress but does not otherwise move. The information pane now takes up the two leftmost icons showing the time, signal strength, battery left up the top with the time at the bottom. The font size has dropped to 75% of its original size – 18pt for the time and date and 9pt for the other information. On the tablet it’s exactly the same, only bigger with the fonts almost doubling in size. 40pt & 20pt for the two sizes in portrait and 34pt & 17pt in landscape. Big Launcher has an option to adjust the font size, though this does not affect that information pane, only the size within the menus, app list, contacts, SMS etc. The font sizes range from 18 to 36 pt on my phone and about the same on my tablet which again means no advantage in terms of font size, although the icons are much larger, coming back almost exactly to the screen size ratio – an area of 10cm2 on the phone vs about 34cm2 on the tablet. On my phone, Gmail pretty much gives me one thing on screen on at a time, whether it’s my list of emails, or the contents of an email, whether I’m in portrait or landscape. The main difference between reading in portrait or landscape mode is how long the lines are. 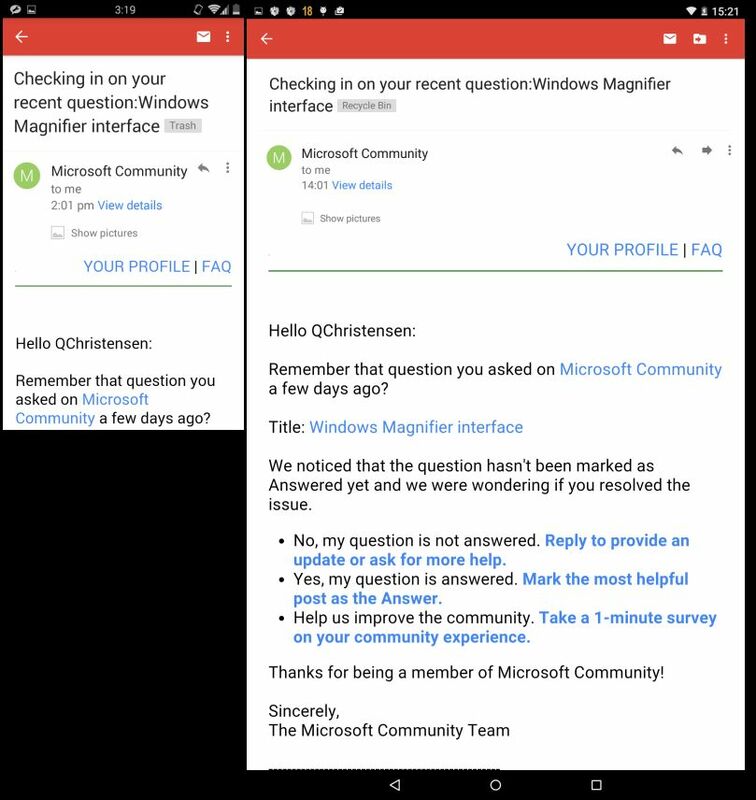 I can see more email messages at once in the inbox list in portrait view, but in landscape, I can see more in preview (as more fits on two lines when the screen is wider). On the tablet it works similarly in portrait mode, although in the inbox view there is a column of icons on the left to enable me to quickly jump to the main folders (If I could figure out the icons). If I press the three lines button on the top left to bring up the list of folders, or slide from the left of screen to the right to expand the icons, the list appears on the left 40% of the screen with the right 60% showing the items in the current folder. 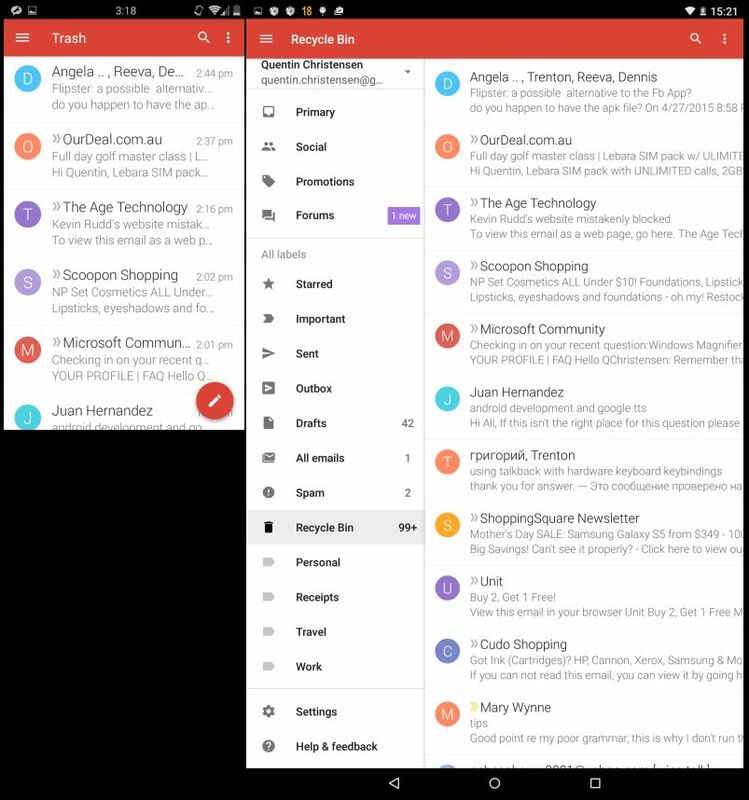 In landscape Gmail adjusts how it presents things in the bigger space. I still have that expandable column of folder icons I can’t decipher on the left, then about 30% of the width is taken up by the list of emails in the current folder (interestingly almost exactly the same amount fits here as I’d see on my phone in portrait mode), and the right half of the screen is taken up by the body of the current message. This gets confusing as suddenly not only does it look different, but the behaviour changes too – If I read a message and then press the back button, instead of taking me back to the folder view (which was already visible), it exits the app back to the home screen. Aqua mail has a couple of options which are important for this comparison. In Settings – “Look and Feel”, there is a checkbox called “Two-panel UI (Use two side-by-side panels)” with an option to allow resizing and the options in portrait mode of splitting the screen horizontally (the same look at in landscape mode), vertically (a more logical layout on a tall, thin screen) or vertical with full screen message view. By default it sets itself up in two panel mode on a tablet. 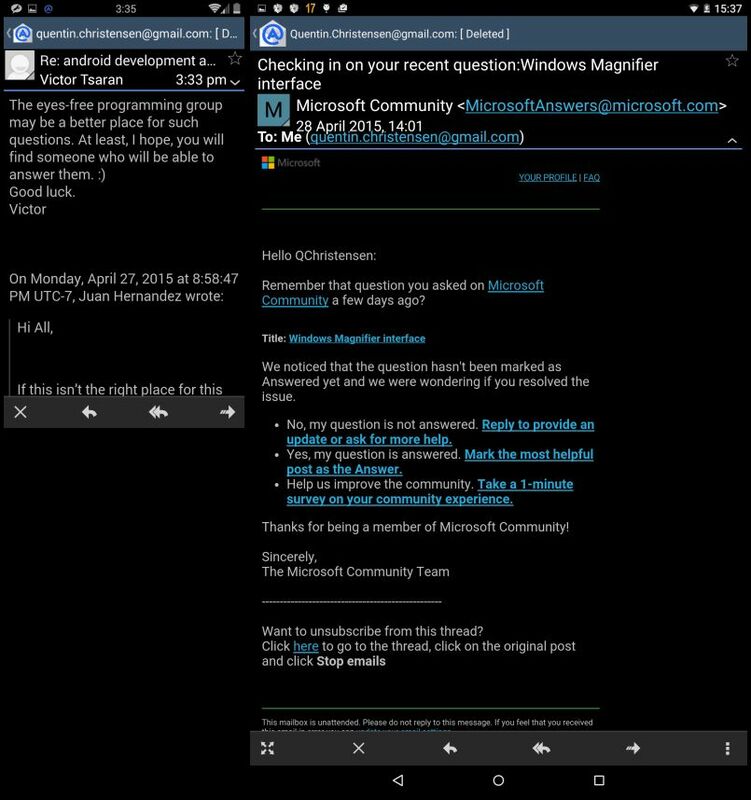 This actually provides too many alternatives to try and present them all here, so what I thought I’d show, was how Aqua Mail behaves set to show a single pane view throughout. I actually prefer this view not only because it is simpler, but also because in full screen (there is a button on the bottom row), with bigger text (you can pinch zoom), I find it easier to read in landscape mode. Setup with a single pane, it doesn’t make many changes from one view to another – everything appears in one list from top to bottom, regardless of screen size or width and the only difference I can notice is that on the smaller screen of the phone, in portrait mode, in the list of emails, the buttons which usually appear on the right of the line containing the current folder name don’t fit there, so appear in their own line at the bottom of the screen. For a low vision user, I very much appreciate that it gives you the option to adjust the user interface. As a low vision user, I would rather the simpler single pane UI throughout regardless of whether I’m on my phone or my tablet. 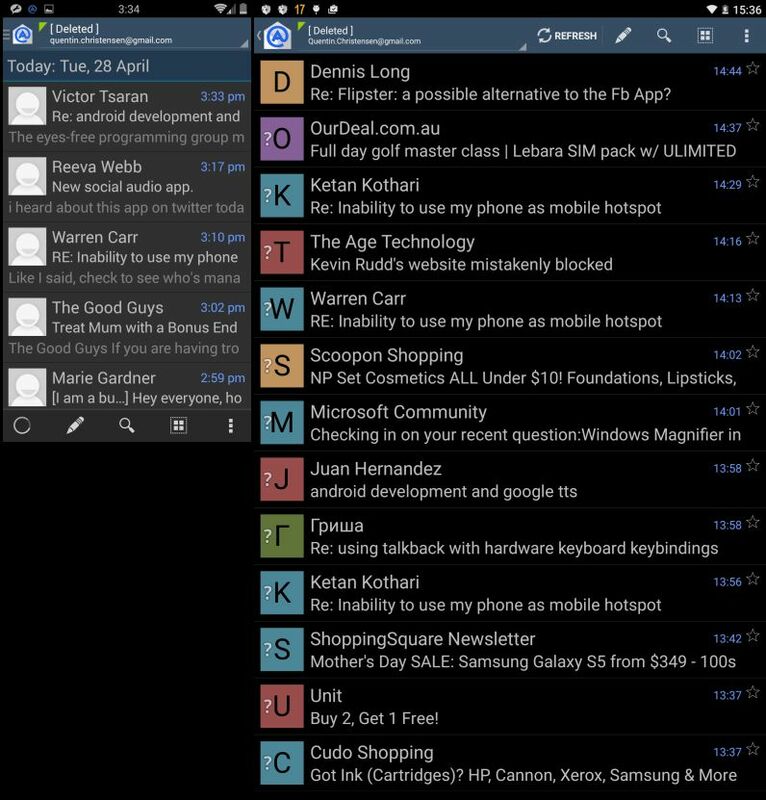 I had a conversation recently with a totally blind user who said he loves the way the “tablet layout” of many apps gives you more information on screen at once and he wished he could do that with his phone – well Aqua Mail would suit him then too as he could have that. Because how an app adjusts between phone and tablet is different for each app, the only way to know for sure how it’s likely to look on your device is either install the app onto your device, or look at the description and screenshots on Google Play. Google encourages developers to include screenshots from each size of device, and if you look at it on your device, you will see the screenshots for your screen size first. Also remember that if you want to try a paid app, you can buy it, and you have (currently), two hours in which you can return it without question (the “uninstall” button in Google Play instead says “Refund” during this time). Also remember that not all apps work on every device, so just because you have an app on one device, you may not be able to install it on another if it has a different version of Android or if one is a tablet and one a phone. Hopefully that gives you a bit more idea of how apps behave from phones to tablets if you are considering a new device, and also encourages you to try out different orientations as some things are surprisingly easier in what initially might seem like the “wrong” orientation. What apps do you prefer on one device over the other? When do you find yourself specifically changing your device to portrait or landscape orientation particularly? Let everyone know your tips in the comments below! This Post was tagged accessibility, android, orientation, phone, tablet. Bookmark the permalink.